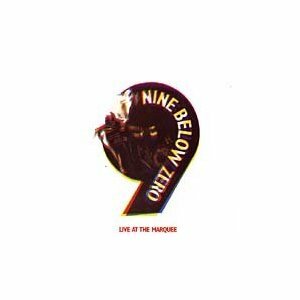 Nine Below Zero (NBZ from now on) are an U.K. (South London) R&B band that came through the post-punk scene in the late seventies. The ballsy London club gigs attracted at first the young mods aka vespa kids, and several EP's were recorded before their 1980 debut album, "Live At The Marquee". It's certainly a bit strange to have a live effort as your first LP release, but NBZ were basically the traditional working-class blues cover band playing the oldies with the occasional original tune. It's just as strange to think of NBZ in the terms of one of the most popular club attractions in London in the year of 1980. You know, considering that you had all those new acts playing Synth, New Wave Romance, and not to mention New Wave Of British Heavy Metal. However, keep in mind that The Blues Brothers Movie did extremely well at the time and there was a small period (1981-82) when NBZ were on British TV almost weekly. They appeared on The Chris Tarrant Show, South Bank Show, the Old Grey Whistle Test, and the very first episode of the cult comedy series, The Young Ones. Vinyl had it's limitations and that is why the 1980 release of "Live At The Marquee" only contained 14 tracks. It's now been re-released and remastered by Universal, with 7 bonus tracks which they had to leave out from the original release. Add to this a decent DVD with 8 songs captured on 16 mm film off the Marquee show with the same line-up consisting of guitarist and lead vocalist Dennis Greaves, vocalist and harmonica player Mark Feltham, bassist Peter Clark, and drummer Stix Burkey. It's a great atmospheric recording which clearly display the proper vibes and high-energy of the band. Expect a lot of harmonica, typical gritty U.K. accent vocals by Greaves and soaring dito by Feltham, and covers such as "I Can't Help Myself", "Can I Get A Witness", "Homework", "Hootchie Cootchie Coo" and "Wooly Bully", etc. It's sort of the UK version of Dr. Feelgood and The Blues Brothers, only with the cheeky attitude of The Jam and various mods. Don't get me wrong, it's proper blues, but the vocals are so typical of its UK era, you can't help thinking about all those other acts and genres. I knew only of a couple of NBZ tracks prior to this, but their fun fast tempo had me instantly hooked. Recommended.